Why stow those dirty wheels INSIDE?? Put them on your Draftmaster and avoid the clutter and mess. 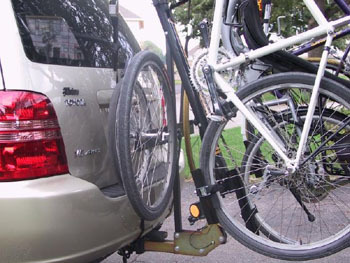 The Draftmaster Front Wheel Carrier can carry up to four front (or rear) wheels safely and securely - in the vehicle draft and out of your cargo or passenger area. Pivots 90° and stows behind the Draftmaster virtually unseen when not in use. Fits all Draftmaster hitch racks.